An auto body shop might have an electrical setup inadequate for conducting squeeze-type resistance spot welds to modern OEM specifications, a panel of experts noted on the latest Society of Collision Repair Specialists educational video. “Its weakest link is the power,” now SCRS Chairman Kye Yeung (European Motor Car Works) said of spot welders on the film, posted free on SCRS’ YouTube channel as part of a spot-welding trilogy. This is the perfect time for shops to evaluate their spot welding infrastructure and practices. General Motors this summer warned that from the 2018 model year forward, the company will outright require repairers to use only squeeze-type resistance spot welding in situations where MIG plug welding had previously been acceptable. Shops who want to work on the fleet of the nation’s No. 1 auto manufacturer will have to buy a GM-approved squeeze-type resistance spot welder and know how to properly use it. And that’s just one of what’s likely many OEMs. 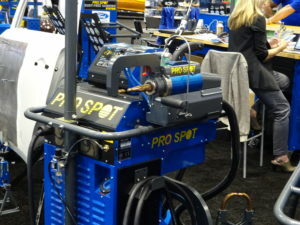 For example, spot welders meeting certain specifications are also demanded for shops seeking Assured Performance (which counts for Ford, FCA, Hyundai and Nissan) or Honda certification — which implies that the devices are necessary for proper repairs on at least some of these OEMs’ vehicles, certified or no. The technology is attractive to shops (and OEMs) for a variety of reasons, according to SCRS Education Committee Co-Chairman Toby Chess (Kent Automotive), one of the panelists on the free SCRS video. Squeeze-type resistance spot welders are easy to learn, and they don’t require the removal of as much of the factory corrosion protection, according to Chess. This makes it less likely that the welder will negatively impact nearby materials like higher-strength steel, which weakens at higher temperatures. The welders squeeze metal between two electrodes and “zap it with some electricity,” Chess said. This generates resistance, which in turn builds up heat of about 2,000 degrees, welding the joint, he said. To make this process work, a shop obviously needs a lot of electricity and the ability to properly convey it to the welder. The video suggested at least 220 volts with a three-phase power supply — perhaps more. SCRS board member Dave Gruskos (Reliable Automotive Equipment) said that when he visits facilities, “99 percent of the shops are on three-phase 220.” But Yeung said he’d heard “that really isn’t a realistic number” industrywide. He recalled recently talking with a shop confident it had a three-phase setup. The shop representative showed Chess a single-phase plug — which has three holes instead of the four on a three-phase outlet. Even a shop with three-phase, 220-volt power can have a resistance spot welder tripped up by other power demands, according to Gruskos. He described scenarios where a downdraft spray booth maxes out the shop’s electricity usage, or the shop owner replaces an older one-phase air compressor with a newer three-phase one. “And now they’re adding their spot welder,” Gruskos said. Interested by what the SCRS panelists had to say about spot welding? Hear more from them during the fast-approaching SEMA. Toby Chess of Kent Automotive will teach “Adhesive Joining in Modern Repairs,” and Dave Gruskos of Reliable Automotive Equipment will teach “Get Attached to Following Procedures: A Comprehensive Guide to OEM Joining.” Barry Dorn of Dorn’s Body & Paint will appear during the first of three OEM Collision Repair Technology Summits as a panelist on “How Automotive Research is Driving Change.” The sessions are part of the Society of Collision Repair Specialists Repairer Driven Education Series Oct. 30-Nov. 3. Register here for individual classes or the series pass package deal. Perhaps the shop’s infrastructure met all of those power demands after all — but what happens when you replace your older spot welder with one capable of meeting new OEM demands? “A great suggestion would be to put in more than you need,” Yeung said. With new equipment coming out, “you want to plan for the future,” he said. Futureproofing might include going up to 440 volts, according to former SCRS Chairman Barry Dorn (Dorn’s Body and Paint). Chess said a 440-volt welder “gives you more latitude with what you can do with it” but can require an expensive transformer addition. A shop might receive adequate power yet stymie the welder with too thin a wire. Chess said he recommends shops have at least No. 4 wire going to the outlet with a 65-amp circuit breaker to use the latest welders. For some shops, budgeting for a squeeze-type resistance spot welder might entail not just the cost of the welder but the cost of upgrading the facility’s wiring. Gruskos likened the wiring issue to a bucket of water with a tiny leak that slowly releases a little water. When you plug in and dead-short a resistance spot welder, “that would be like banging a hole in that bucket, all the water shoots out,” Gruskos said. There’s not enough power left to replenish it and get the welder working when one’s wires are too thin. “It’s predicated on the diameter of the wire going to the outlet,” Gruskos said, who observed that some electricians might call for an even thicker No. 2 wire — which might not even fit into a shop’s electrical pipes. A larger gauge of wiring also allows the shop to operate the welder with an extension cord, Yeung noted. The shop might also be frustrated by an inadequately grounded power system. Gruskos said that building grounds in the past were often connected to the water pipes. But if the utility switched the water meter to a plastic one, the shop might have lost its ground connection and not even known it. “You have to ground your outlets to earth,” he said. A ground spike might be necessary. Similarly, an old electrical conduit painted over the years might be unable to be used as a ground. “You want to really check that,” Gruskos said of grounding. “That’s been a very big problem.” Telltale signs of an improperly grounded welder might entail lights or computer flickering when a technician is spot welding. Left unaddressed, such a welder can do “significant damage to itself” and other electric technology.